Although Microsoft might be better off, Wall Street certainly thinks so, his departure will be a huge loss for tech pundits and comedians. 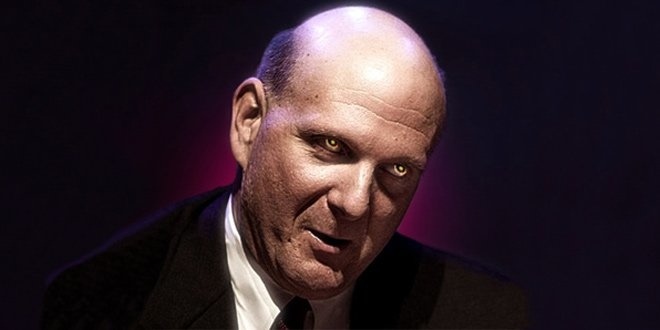 Steve Ballmer quotes and, frankly, his antics are the stuff of legend. Whether you are laughing at or with him, Steve’s a funny guy, here is a quick list of his more memorable sound bytes on Apple. • The most common format of music on an iPod is “stolen” —On the music found on iPods, 2004. • No, I do not [have an iPod]. Nor do my children. My children — in many dimensions they’re as poorly behaved as many other children, but at least on this dimension I’ve got my kids brainwashed — you don’t use Google and you don’t use an iPod —On iPods, 2006. • There’s no chance that the iPhone is going to get any significant market share. No chance. It’s a $500 subsidized item — On the iPhone, 2007. • $500, fully subsidized, with a plan! That is the most expensive phone in the world and it doesn’t appeal to business customers, because it doesn’t have a keyboard, which makes it not a very good email machine — On the iPhone, 2007. • In the competition between PCs and Macs, we outsell Apple 30 to 1. But there is no doubt that Apple is thriving. Why? Because they are good at providing an experience that is narrow but complete, while our commitment to choice often comes with some compromises to the end-to-end experience. Today, we’re changing the way we work with hardware vendors to ensure that we can provide complete experiences with absolutely no compromises. We’ll do the same with phones — providing choice as we work to create great end-to-end experiences —On Apple, 2008. • We’ve had Windows 7 on, tablets and slate machines now for a number of years, and Apple has done an interesting job of putting together a synthesis and putting a product out, and in which they’ve — they sold certainly more than I’d like them to sell, let me just be clear about that — On the iPad, 2010. • Apple is Apple. They’re always a little tougher to compete with. They’re a really good competitor, and tend to be a really high-priced competitor. People worried a little bit about our bottom costs. They’ve got a lot of margin in those devices, which creates a lot of room in which to operate. Okay. We’ve competed with Apple before — On Apple, 2010. • But we are not going to let any piece of this [go uncontested to Apple]. Not the consumer cloud. Not hardware software innovation. We are not leaving any of that to Apple by itself. Not going to happen. Not on our watch — On Apple, 2010. • Windows machines will not be trucks — On the post PC era, 2010. • In every category Apple competes, it’s the low-volume player, except in tablets —On Apple, 2012. 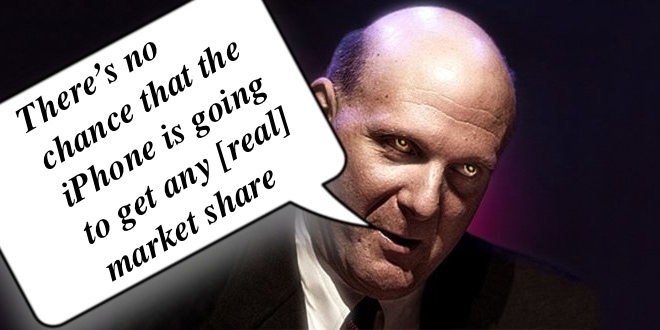 What are your favorite Steve Ballmer quotes? Or, do you prefer his physical, often sweaty, humor?